Need cheering up in this season of abysmal news, when even the weather can no longer be taken for granted and Spring can’t make up its mind whether to be here or not? Sunshine prevails in the stunning 93 John Singer Sargent watercolors now assembled at the Brooklyn Museum. The fact that the Brooklyn Museum and the Massachusetts Fine Arts Museum (MFA) own the lion’s share of the artist’s watercolors is a miracle. According to Teresa A. Cabone of Brooklyn and Erica E. Hirshler of the MFA, who co-curated the exhibit, during the first decade of the twentieth century Sargent wanted to free himself from the heaviness and formality of oil, and instead concentrated on watercolors. He had no intention of selling them, but his friend and fellow watercolorist Edward Boit convinced him to mount a joint exhibition at Knoedler’s. At the exhibit the Brooklyn Museum bought all the Sargents. The two friends continued to paint watercolors and two years later they had another joint exhibition. This time the MFA bought all the Sargents before the exhibition opened. By their very nature watercolors look spontaneous. Unlike oils, watercolor cannot be over-painted or scraped. Most often watercolors are done in a single sitting. Perhaps because of their immediacy Sargent took great care to arrange his models—often family members and friends—and his props. He used underdrawings and applied wax to spaces he wished to leave white. The wax also reflected light. 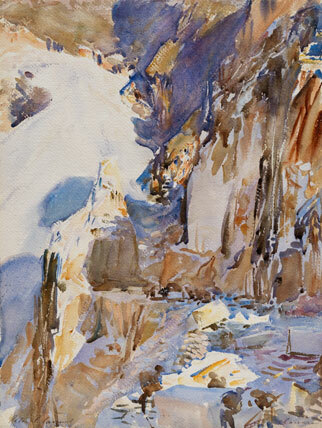 The watercolors, many done in Venice, Florence, the Carrara quarries, North Africa, and the Alps, are exquisite. Each one of the sites had its special charm. The Venetian ones enhance the beauty and luminosity of the magical city. The North African ones served as a basis for the Triumph of Religion, the murals commissioned by the Boston Public Library Sargent was working on when he died in 1925. The watercolors done in the Alps depict a family holiday, during which his traveling companions relaxed under parasols or played chess; those done in the Carrara marble quarries allowed the painter to explore the uses of whites, endowing the watercolor with an almost cubic style. The Sargent watercolors will stay in Brooklyn until July 28, 2013. Thereafter they’ll travel to the MFA (10/13-1/20/214); and then to The Museum of Fine Arts, Houston. Hurry, it is a once in a lifetime opportunity. And what, you may wonder, happened to the watercolors of Edward Boit? Today his biggest claim to fame is that he was the father of the girls in The Daughters of Edward Boit, one of Sargent’s best known paintings and a proud possession of the MFA. This entry was posted in Art review and tagged art, arts, brooklyn museum, carrara, edward boit, erica e. hirshler, erica hirshler, fine art, fine arts, florence, john singer sargent, massachusetts museum of art, mfa, north africa, sargent, teresa a. cabone, teresa cabone, the alps, the carrara quarries, the daughters of edward boit, the museum of fine arts houston, the triumph of religion, venice, watercolor, watercolors, watercolour, watercolours. Bookmark the permalink.